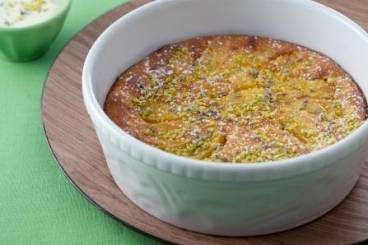 A ripe peach dessert from the Limousin region of France, served with honey, lavender and pistachio flavoured creme fraiche. For the creme fraiche: chop the pistachio nuts into small pieces, mix with the pistachio paste and the creme fraiche. To serve, cut the clafoutis into wedges, finish with a drizzle of honey, a sprinkling of lavender and a dollop of creme fraiche.